Food security has been on the international agenda for some time. But the projected impact of climate change, together with rising population, has elevated the issue to emergency status. With total arable land already decreasing at a worrying rate—it’s estimated nearly 33% has been lost across the planet over the past 40 years through erosion and pollution—a further increase in global average temperatures could be catastrophic. Here in Australia, for example, climate models suggest drought could be as much as 20% more common by 2030 across much of the country, and up to 80% by 2070 in south-western Australia, an area currently responsible for much of our cereal cropping. Clearly, the rapid development of new crop varieties able to grow and produce higher yields in harsher, more marginal conditions is becoming critical; and research at the University of Adelaide is helping to make it happen. A team led by the School of Computer Science’s Australian Centre for Visual Technologies (ACVT) is developing world-first image-analysis technology capable of accurately estimating potential new cereal varieties’ yields after very short periods of growth. 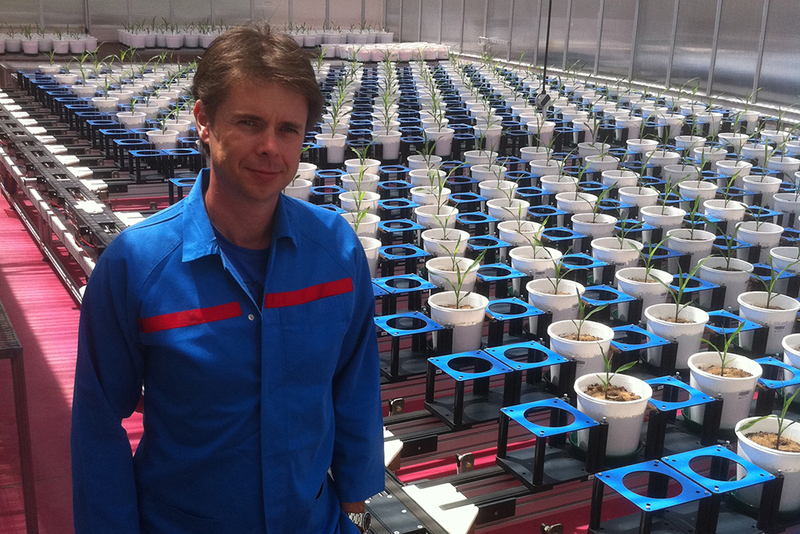 “This novel approach promises to absolutely transform crop breeding,” says lead researcher and director of the ACVT Professor Anton van den Hengel. The system will use multiple images taken from numerous angles to construct computerised 3D models of the plants for analysis. Once completed, it will be incorporated into the state-of-the-art Plant Accelerator at the University’s Waite Campus. According to Professor van den Hengel, this advanced facility will provide vital complementary capability for the research team. “The Plant Accelerator’s fully robotic plant management system allows automatic and repeatable control of the growing conditions of up to 2400 plants at a time, and will enable automatic delivery of those plants to our imaging stations. “That’s going to allow us to rapidly provide detailed, accurate estimations of vast numbers of crop varieties’ potential yields under all kinds of climate-change-related stresses, such as high salinity or drought. Industry partner Bayer CropScience will assist with commercialisation of the groundbreaking technology. This entry was posted in Agriculture & Food, Uncategorized and tagged Agriculture, Australian Centre for Visual Technologies, food security, School of Agriculture Food & Wine. Bookmark the permalink.